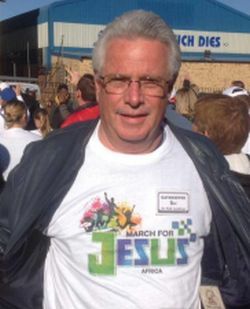 “I truly believe that the Church has a responsibility in this season to put the Kingdom of God on display and to proclaim with authority that we have a solution – a message of hope and peace,” said Dr Nico Landman ahead of the 5th annual Africa March For Jesus in Johannesburg on June 16. 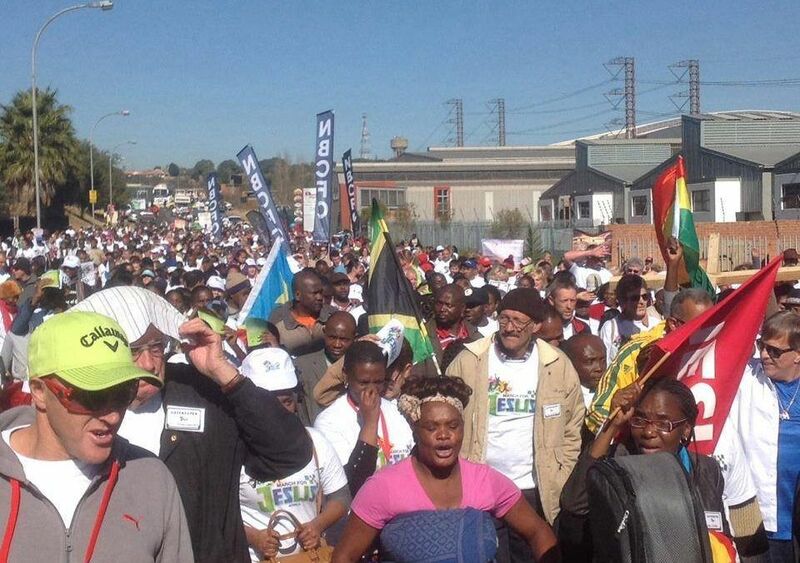 The march from the corner of Green Hills and Sam Green Road, Meadowvale to Mount Zion Prayer Hill, Beula Park, Ekurhuleni, from 9am, will not be over a long distance – nor is it about the size of the crowd – but it will be a prophetic action and a display of Kingdom unity, said Landman who initiated the first Africa March For Jesus in 2014 after experiencing the amazing March for Jesus in Brazil the previous year. At the time he was contacted by the organisers of the Brazil march in 2013 and invited to attend, he had not yet heard of the event in that nation and his immediate response was that it would not be possible to attend. But God stirred something in his spirit and he felt he had to go to Brazil and within two hours of his invitation arrangements were made to go there. He said he was overwhelmed by what he experienced in the Brasilian capital São Paulo where more than 800 000 Christians marched through the city in a column that stretched for 5km. “It was not a man thing but a divine movement – there was an open heaven,” he said. The March for Jesus in Brazil, now in its 26th year, is supported by millions of people in cities throughout the nation. In the 25th anniversary march last year there were two million participants in São Paulo alone. According to the march’s official website “..it is a prophetic act, marked by the praises and cries of a people who believe in the transforming power of the Gospel”. The next march in Brazil is set for next Thursday, May 31. Landman, who is the founder and visionary of the Beulah Park/Mount Zion CPR (conference, prayer and resource) Centre, said the Brazilian march hosts asked South Africans at the 2013 march if they would like to duplicate the march in SA. Landman said he realised that he could not duplicate the march in South Africa but that he could “plant a seed” and so in 2014, the same year that marches started in the Congo and Zambia, he launched the first march in Johannesburg. Mindful that South Africa is destined by God to be a divine gateway to Africa, and because the Beulah Park/Mount Zion CPR has participants from around Africa, he positioned it as the Africa March For Jesus. There were representatives from about 15 African countries at the inaugural march. The day before last year’s march, which was scheduled for June 24, the organisers received a word from a Congolese pastor: Haggai 1:14-15 — And the Lord stirred up the spirit of Zerubbabel son of Shealtiel, governor of Judah…and the spirit of the whole remnant of the people….on the twenty-fourth day of the sixth month. This word inspired them to open the March 4 Jesus nationally in 2018 and they sent details to 150 cities and towns inviting them to participate. They also experienced a technological breakthrough which has enabled them to livestream the June 16 march which gave them a vehicle to share the march nationally irrespective of what happens on the ground around the country. Radio stations were also coming on board. Landman said it was easy to become disheartened when people did not appear to respond in numbers to a divine call to action but he believed the important thing for him was to be obedient to the call to clearly proclaim healing and hope in Jesus. Significantly, the March 4 Jesus campaign has joined hands with the Healing the Nations prayer campaign launched by Linda Gobodo of Vuka Africa on June 16 last year, he said. The main activities on the march would be to pray, proclaim and praise. 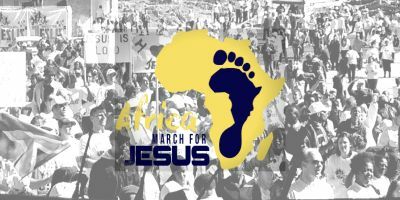 More information on how to participate in the Beulah Park/Mount Zion march, or how to be involved in your area, or how to access the livestream, is available on the website www.africamarchforjesus.co.za or by calling 087 701 0893.